A customer from Colorado wanted something really special for his wife on their milestone anniversary of 50 years. 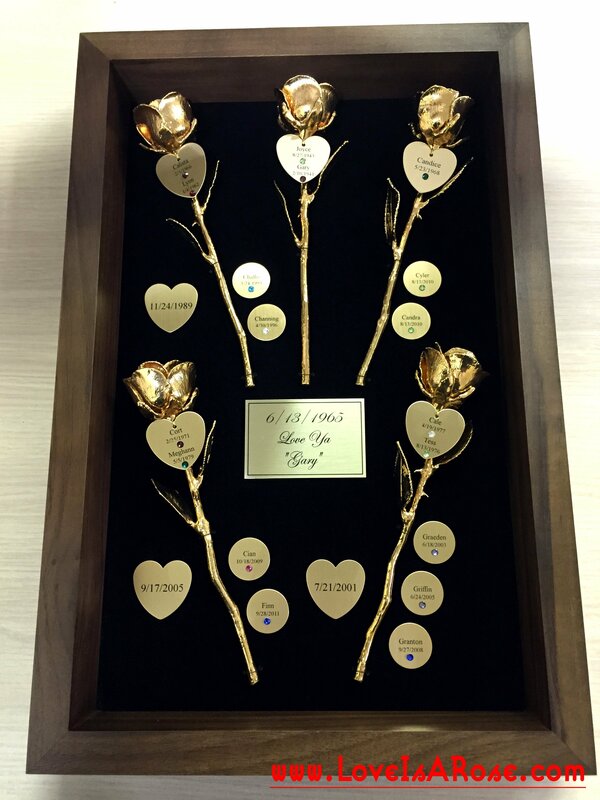 So we created a Custom 5oth Anniversary Gift out of a shadow box, our gold roses fully dipped in 24k gold, and our engraved hearts and discs that are used with our beautiful engraved family trees. This is a truly brand new custom gift we have never done before and we couldn’t be more pleased with how it turned out. Attached to each 24k gold dipped rose is a heart charm engraved with each parent’s first names and birth dates, with the grandparents who are celebrating their 50 year legacy in the middle at the top. Then, to the left of the gold roses, there are hearts with the married sons and daughters wedding dates engraved. To the right of the roses we engraved discs with all first names and birth dates of the grandchildren. Accompanied by every person’s birth date is their lovely birthstone, and to top it all off, we engraved a 2″ x 3″ gold plate with the wedding date of the 50th anniversary and a special little message from the husband. A 50th anniversary is a milestone that not everyone gets the chance to experience. It takes dedication, unconditional love, patience, forgiving, forgetting, giving, and letting go. When two people triumph over the highs and the lows you can experience in a lifetime, it is truly a reason to celebrate. It sets a beautiful example for the generations to follow. It shows true love really can conquer it all. Find more beautiful Custom 50th anniverary Gifts to last a life time at our site www.LoveIsARose.com .